Cleaning glass with newspaper- Really? You have always wanted those spotlessly clean, streak-free glass windows or doors or furniture and have tried every trick in the book to get the desired results? You wanted to impress your guests with that great looking glass furniture and instead greeted them through lint-laden glass doors? You must have heard that a newspaper with a vinegar and water solution is the best remedy, but have never tried it because it may sound so easy but ineffective. Believe me when I say, it is the best solution to get streak free and good-as-new glass furniture. The most expensive multipurpose rags or napkins will leave behind traces because of the nature of the material, but newspaper will not. Just a spritz of the vinegar and water solution, and a swipe or two of the newspaper will keep your furniture clean. The more regularly you clean up the easier it is to maintain the glass and the grime comes off faster. 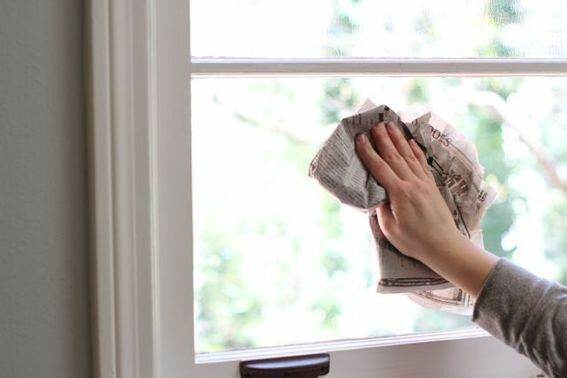 The drawback of cleaning with a newspaper is that it is capable of leaving ink behind on the molding or the trim or on your hands, hence it is advisable to use gloves while cleaning. Many papers in magazines have a material called sizing that makes them almost water repellent. But newspapers have little to no sizing that makes them super absorbent- this is likely what makes it so effective at cleaning glass. That is why they make sich a friendly glass cleaning companion. Some theories state that the old petroleum based ink has a quality comparable to a light sandpaper, some say that the newspaper inks used today are less likely to leave behind streaks than the inks of yesterday. What’s more- the newspaper is easily found at home and is an inexpensive cleaning option. Its recyclable and hence a better option when it comes to being eco-friendly.